It is important to show realtime updates of what is happening in an application, and one form of this is a realtime counter. A realtime counter can be used to show users of an app how other users are interacting with their content. For example, Instagram uses a realtime counter to show when viewers like a live video. This makes users of the application feel more engaged as they will be getting immediate feedback when things change. We will be using Kotlin to develop both the realtime web server and the Android application, so a basic working knowledge of Kotlin and Android development will be required to follow this tutorial. We will build a web server that keeps track of how many times a button has been clicked. The web server will also expose an endpoint which the Android application can call to send click events, the web server would then increment the click count and send a broadcast using Pusher to all clients currently subscribed to the click event. Before we get started, you would need to create a Pusher application. Go on to Pusher and create an account, but if you already have an account, just login. Then, create a new app from the dashboard and store the apps keys as we would be using them later in this post. You can change the group and version to something that suits your project. In this case it is set to kotlin-realtime-counter. This ClickCount class will be used as a data object to encapsulate information about the number of times a click has be recorded. It’s importance will be seen later in the post. Next, create a file named App.kt inside the src/main/kotlin folder. In the App.kt file, we need to first define some external functions and classes that would exist normally in the Node.js environment. This way, Kotlin would know the signature of these functions and not throw an error when they are being used. Pusher: Here we are declaring the Pusher class and the Pusher.trigger() function we will be using later on. The [@JsModule](https://kotlinlang.org/api/latest/jvm/stdlib/kotlin.js/-js-module/index.html) indicates that this class should be imported from the pusher library we added as a dependency earlier. External class declarations having the @JsModule are typically used to declare classes of external modules that need to be instantiated using the new keyword, as Kotlin doesn’t support the new keyword. Next, we initialize our server and Pusher configuration values. You would need to update your pusherConfig object values with the keys you got from creating a Pusher application earlier. The currentClickCount variable will be used to keep track of the number of times a click has been recorded. Next, we implement the main function that would be run when our code is executed. GET /counts: HTTP GET requests will be sent to this endpoint to get the current click counts recorded so far. The currentClickCount is then returned as a JSON object of ClickCount. POST /clicks: POST requests will be made to this endpoint to indicate that the button has been clicked. This will record the click count by incrementing the currentClickCount and then send a broadcast of the updated currentClickCount using pusher to all listeners of the clickEvent on the clickChannel. And lastly in the main() function, we expose the express server to listen on port 9999. And voila 👏, you should have the realtime server now running on port 9999. The whole code for this server can be found in this repository. Now, let’s go on to build the Android application that would be interacting with this server. 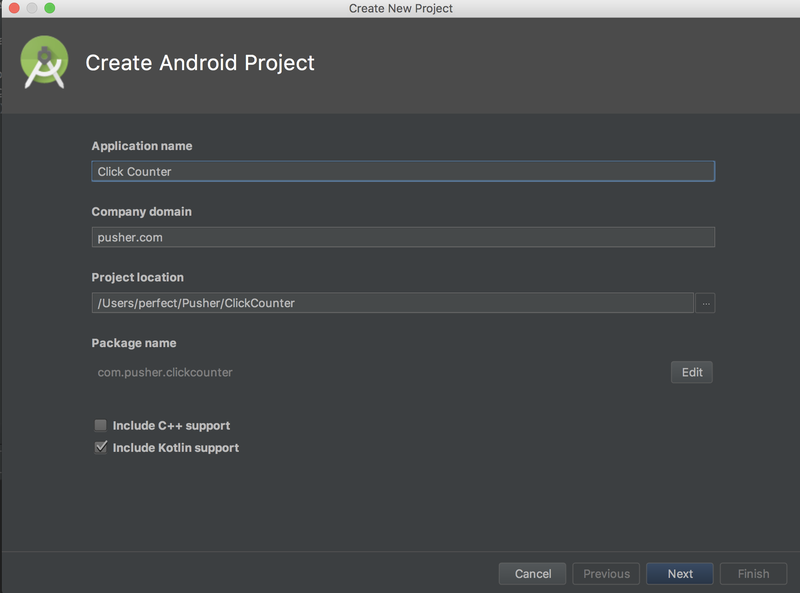 To make it easy to get started with Kotlin for Android development, we will be using Android Studio 3.0 as this version has the Kotlin plugin bundled with it. If you are using an Android Studio version less than than 3.0 refer here for detailed instructions to get started. Click on Next several times and then Finish and the Android project will be created and setup. If you are using an Android Studio version earlier than 3.0, you should replace implementation with compile. implementation was introduced with Gradle 3.0 and compile is now being deprecated. You can read more about these changes here. android:text="Click to show some love"
android:text="Number of clicks so far is:"
The layout is pretty straight forward, things to note are the FloatingActionButton with id clickButton and the countTextView to display the current click count. Next, open the MainActivity.kt class and lets write the code that ties all the functionality together. Inside this file, start by defining some configuration constants and initializing some required variables. const val SERVER_URL = "http://NODE_JS_SERVER_ENDPOINT"
const val PUSHER_API_KEY = "PUSHER_API_KEY"
const val PUSHER_CLUSTER = "PUSHER_APP_CLUSTER"
const val CLICK_CHANNEL = "click-channel"
const val CLICK_EVENT = "click-event"
Note that you would have to set the SERVER_URL to the actual url where your realtime server is running. Also, update the PUSHER_API_KEY and PUSHER_CLUSTER values to your Pusher applications credentials. First, we fetch the current click count by invoking the fetchCurrentClickCount() method. Next, we connect to get realtime updates of when the click count changes. Finally we attach an onClickListener to the clickButton button. We are able to get a reference to the clickButton button directly without having to use findViewById() because of the Kotlin Android Extensions plugin we applied to this project in the build.gradle file. Now let us explore the contents of the fetchCurrentClickCount(), connectToRealtimeUpdates() and postClick() functions respectively. This method makes a GET request to the servers /counts endpoint and updates the countTextView's text with the count gotten from the servers response. The showError() function displays a Snackbar containing the msg passed in and an action button. When the action button is clicked, the callback is invoked. Notice the type of the callback function is an extension function on Snackbar ( i.e. Snackbar. (View) → Unit ). This makes it easy for the calling code to have access the Snackbar instance without explicitly passing a reference to the callback. The connectToRealtimeUpdates() method subscribes to the Pusher CLICK_CHANNEL and binds an event listener to CLICK_EVENT' events on the channel. The event listener deserializes the data into a ClickCount object using Gson and then updates the countTextView's text with the count provided. The postClick() method is invoked when the clickButton is tapped. It sends a POST request to the servers /clicks endpoint. If an error occurs while posting the click event, a error Snackbar is displayed via the showError() function. And finally, in the activity we connect and disconnect pusher in the onResume() and onPause() lifecycle methods respectively. There you have it. The realtime counter Android application is now ready. You can find the complete code for the Android application here. To test it out, ensure that the realtime server we built earlier is running and the Android application’s SERVER_URL is updated accordingly. Now, run the application on multiple devices. You would notice that as you click on the button, the count increases in realtime across all the devices. It has been a long post, but we were able to see how Pusher can be used to build a realtime counter. We have also seen how we can use Kotlin’s super powers to supercharge our application. Sharing similar Kotlin code between the server and Android application. For example, the ClickCount class can be moved out to a separate module and shared between the server and Android applications. Link to a sample project that achieved this can be found below. Changing the data type for the counter from Int to something like BigInteger to handle larger counts. Persisting the currentClickCount to a database. Note that this may give rise to some other issues that need consideration such as atomically incrementing the click count to avoid race conditions. Let me know in the comments below if you have any questions or suggestions to improve this tutorial. I’ll love to hear your thoughts. Cheers!